When my children were little, I really, really didn't enjoy those books with just a word here or there. Those Richard Scarry books with pictures of thing, thing, thing, for instance. By the time I'd point to "table," "chair," "cupboard" and read the words under them, I was done. And then there were books of shape, shape, shape. And, of course, books of color, color, color. When my oldest son was in kindergarten and his brother was in preschool, I started reading them novels, because I was that close to losing my mind. 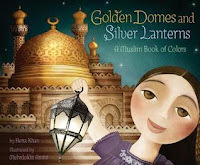 How much I would have enjoyed reading them Golden Domes and Silver Lanterns by Hena Kahn with illustrations by Mehrdokht Amini. "Blue is the hijab/Mom likes to wear./It's a scarf she uses to cover her hair." Real sentences! A beautiful two-page spread with something happening in it instead of a blue circle or square. Oh, my gosh. And eleven more colors are covered, including...get this...silver. Seriously, when do you see silver in a kids' book about colors? I know picture books are for children, but adults have to read them, too. And that's why a beautiful book like Golden Domes and Silver Lanterns is such a treat. The biggest draw here is described in the book's subtitle, A Muslim Book of Colors. For nonMuslim readers like myself, the content of this book is unique. "Purple is an Eid gift/just for me./I open it up/and love what I see." I'd never heard of Eid before. It involves presents! Golden Domes and Silver Lanterns is an example of why diverse books can be a pleasure. Sometimes it's just such a relief to read something new. Who doesn't like a holiday that involves gifts, including gifts of cash? Gorgeous book - I actually bought a copy of this for my kids' school library a few years back.